Elitegroup Computer Systems (ECS), the global leading motherboard, Mini-PC, Notebooks and mobile device manufacturer, is pleased to announce its partnership with Quividi, the industry standard for Attention and Audience Analytics in digital signage. ECS will provide a range of Quividi-compatible entry-level digital signage hardware, ranging from smart cams sticks to mini-PCs. ECS’s Smart Cam Stick PS02SC and Mini-PC PB01CF have been officially approved by Quividi, for their full capability of running Quividi’s VidiReports 6.x software. ECS’s Smart Cam Stick is an all-in-one tiny stick PC embedded with a camera module that has the potential to turn any display into a powerful digital signage screen with facial detection capability. Install a Smart Cam Stick on signage, sign up to the Quividi service, and it can determine your audience demographics (age, gender,..) and engagement (position, dwell and attention, mood) . The right contents can then be delivered to the right audience and in the right contet. Anonymous data are uploaded to the cloud, and generate useful customer insights reports. With the complete I/O ports, one HDMI and two standard USB ports, the Smart Cam Stick can meet variety needs of applications. ECS’s Mini-PC PB01C is a small yet powerful mini PC that turns an actual PC into a chic, compact 0.15L tiny box. Equipped with the latest Intel® Celeron® N3350 CPU, PB01CF owns the power to display high-quality 4K2K video smoothly. 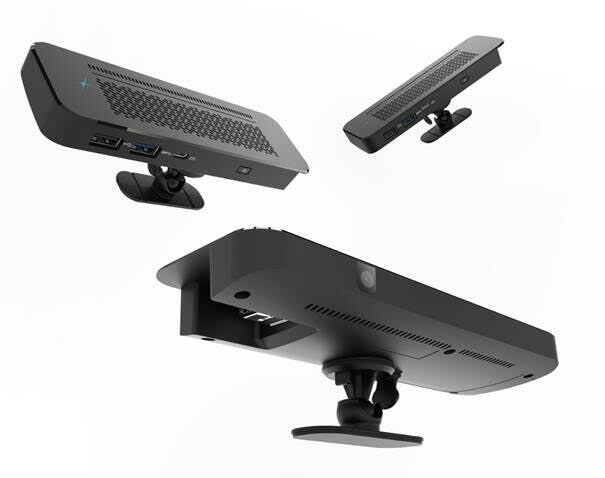 You can easily hide this mini-PC in the back of monitors with VESA mount bracket. Being configured with fully I/O, HDMI, USB 3.0, USB 2.0 and RJ-45 LAN port, PB01C can perfectly fit into any situation. Besides, the feature “Remote Power Control” and “Watchdog” make it convenient and stable while playing the contents. “The form factors offered by ECS create new design possibilities for vertical digital signage applications where Quividi’s computer-vision technologies can help increase customer engagement,” said Ke-Quang Nguyen-Phuc, CEO Quividi. « With this integration, ECS’s end-users will have a direct and easy access to Quividi’s wealth of analytics and interaction capabilities ». Quividi’s VidiReports determines, in real time, the number of viewers, broken down by demographics (age, gender), facial attributes (glasses, beard) and mood, as well as the opportunities to see, and the viewers’ attention time.